WESTPORT, Conn., April 11, 2018 — Edward Nusbaum, a Westport-based family law attorney was recently selected by his peers for inclusion in Best Lawyers® in Connecticut 2018 in the practice area of family law. Best Lawyers is universally regarded as the definitive guide to legal excellence. Best Lawyers Connecticut, which began publishing in 2011, appears in The Hartford Courant and The Fairfield County Business Journal. 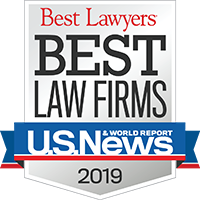 Nusbaum has been listed in Best Lawyers in Connecticut since its inception. Inclusion in Best Lawyers is based entirely on peer-review. The methodology is designed to capture, as accurately as possible, the consensus opinion of leading lawyers about the professional abilities of their colleagues within the same geographical area and legal practice area. Best Lawyers employs a sophisticated, conscientious, rational and transparent survey process designed to elicit meaningful and substantive evaluations of the quality of legal services. The organization’s belief has always been that the quality of a peer-review survey is directly related to the quality of its voting pool. Nusbaum has been practicing family law in Westport for more than 35 years. He has been a Martindale-Hubbell AV Preeminent-rated attorney for 24 consecutive years and been named a Connecticut Super Lawyers Top 50 attorney by Thomson Reuters. He has been rated Best Lawyers in America© for 23 consecutive years and ranks among the top five percent of private practice attorneys nationwide. The Law Offices of Edward Nusbaum P.C., located at 212 Post Road West, represents individuals with substantial assets in all areas of family law matters, including divorce, alimony, child support, property division, child custody and relocation cases. A significant portion of the firm’s work is concentrated in Fairfield County, yet its geographic reach often extends throughout the state. For additional information on the Law Offices of Edward Nusbaum P.C., please visit its website at http://www.nusbaumfamilylaw.com/ or call 203-226-8181.